Tech Impact's living annual report is accessible via our website and is consistently updated with real-time data so clients, donors and board members can see how we're doing at any time. Motivate your team. Competition isn’t always healthy, but sometimes it can provide a little incentive to make people really shine. Create dashboards to show the relative impact of different teams in your organization and inspire everyone to do more. Report from multiple systems. You don’t need a fancy single system to be able to report on all the work your nonprofit is doing. Dashboards can pull in and combine data from many systems to give you a single source of truth – regardless of how many databases you are required to use. Report from mandated systems. We all have systems that drive us crazy but our funders make us use. Dashboarding tools allow you to take those terrible Excel exports and turn them into modern, interactive, works of art. You just need to download the excel file, put it in a folder, and the rest is done for you! Predict staffing needs. Is your nonprofit guilty of the “guess and hope for the best” method of predicting staffing needs? Many are. The good news is that there are dashboarding tools that visually show when your current pace of work won’t be possible with your current staff. This can help you anticipate staffing needs well in advance. Empower direct service staff with feedback loops. Most nonprofits make their staff collect data but never show that data to the people doing the work on the ground. Dashboards provide a unique opportunity to show your direct service staff how changes in their work impact their clients. Don’t wait years to learn what works, help your staff figure it out by closing the loop. 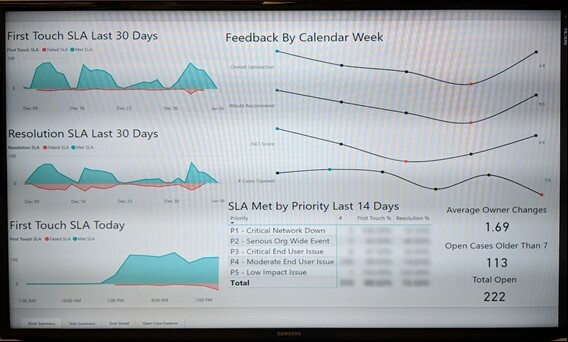 This is an example of a dashboard that's displayed on monitors throughout Tech Impact's office so everyone can see how were' dong at a glance. It works too! When we start to struggle (because of staff being off or high volume), we can immediately see the change in the data and implement changes before it's felt by our clients. Be transparent. Show your community the impact of your work in real time through dashboards on your website. Being honest and transparent about satisfaction and impact is one important way to build buy-in and trust with the communities you serve. Tell a story. Interactive dashboards hold attention and tell stories better than big blocks of text. Combine anecdotal videos, photos, and audio with interactive dashboards to tell a deep and compelling story. There are several dashboard options available for nonprofits – Power BI and Tableau are just two options that provide nonprofit pricing. If your organization is using Office 365, Power BI may be the best option for you based on the price and functionality. 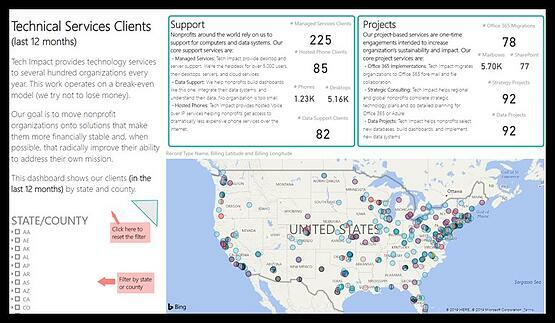 Interested in learning more about how dashboards can change the way your nonprofit works?